• A flight controller born from the intrgration of cutting edge electronics and innovative information technology. 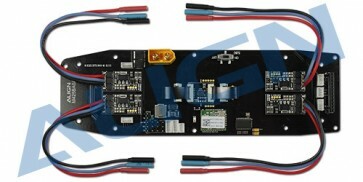 Utilizes a 32 bits high speed processor, combining ESC, power distribution systen, OSD, Bluetooth connectivity, and gimbal control function. Featuring high precision 6-axis gyroscopic sensor and barometric sensor. Drived from Align's core technology, the highly intelligent attitude calculation subroutine results in a highly stable and reliable performance. • Bluetooth 4.0 compatibility featuring low power long distance high speed transmission. • Live Flight data display including flight time, mode, attitude, voltage, capacity, current, camera mode, recording mode, and low voltage warning. • High intensity LEDs. With RGB colors customizable through smartphone app.